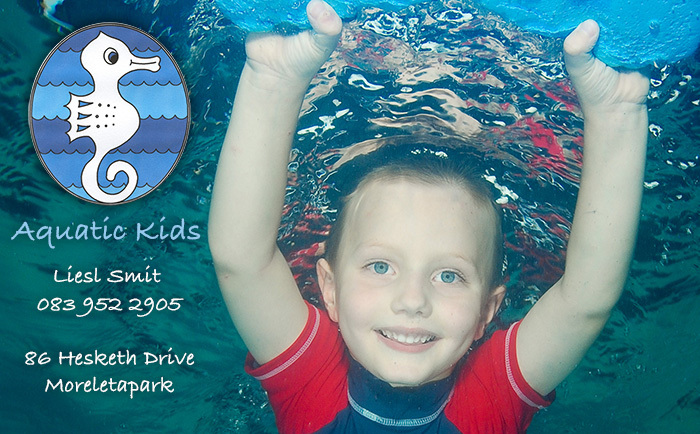 Aquatic Kids swim school is situated in Hesketh Street, Moreleta Park in the East of Pretoria. Aquatic Kids swim school was established in 2002 and offers enjoyable swimming lessons for babies and toddlers in a warm, heated indoor pool. All of our instructors are friendly, caring and have a love for each and every child. We teach babies from 6 months of age to children around 7 years. At Aquatic kids we understand that each child is different and makes progress at their own pace. The baby class offers water awareness and water safety, in an environment where both mom and baby / dad and baby can have loads of fun together in and under the water. This proves to be a perfect opportunity to bond with your baby of any age. This is the best way to introduce your baby to water, to build their own self confidence and learn to love the water. The Learn to Swim classes start at the age of about 2½ years of age. However, we evaluate the level which the child is at and possibly an older child may need to begin at the beginner level as well. We encourage children to develop their own love and feel for the water with lots of fun activities at the same time building trust with their instructor. Our main focus is water safety. Should a child fall into the water accidentally, this will give them the confidence and skill to get to side of the pool safely. We are passionate about what we do and desire to see every child water safe with a love for swimming! Hi, I would like my baby to start swimming. He is 1 year old. Please can you provide me with a quote.